Heat the oven to 170C. Spread the nuts over a baking sheet and toast in the oven until fragrant and one shade darker, 5-10 minutes. Take care they don’t burn. Break into smaller pieces and set aside. Cut the spinach leaves into wide ribbons and wash in plenty of cold water, letting the dirt sink to the bottom of the bowl. Repeat with fresh water if necessary. Leave the spinach in the water. Break the Gorgonzola into small pieces. Roll your pasta out into sheets in the usual way (see other recipe). Lay a sheet vertically in front of you on a floured surface. Sprinkle more semolina flour over the top and fold it in half from top to bottom. Sprinkle over plenty more flour and fold again. Repeat until you have a neat small rectangle. Cut the dough into ribbons. (Remember that they’ll expand when cooked.) 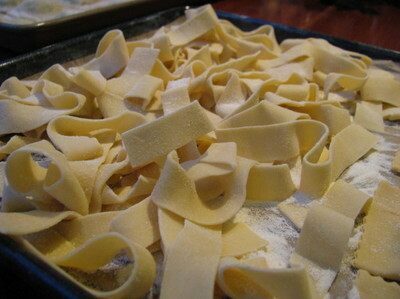 Separate the ribbons with your fingers, tossing them with the semolina flour to ensure nothing is sticking. Place pappardelle in a loose heap on a lined tray. Repeat process with remaining dough. Let pasta sit for 20 or so minutes. Put a large pot of water on to boil. When it’s boiling add a generous amount of salt. Shake off excess semolina before putting the pasta in and don’t crowd the pan. It’s best to add them in batches and let the water come to a boil before each addition to avoid them sticking. They will take 2-3 mins. Meanwhile heat a wide shallow pan with curved sides. Add the butter, melt, then add the garlic and let it soften for a couple of minutes. Add the spinach leaves, shaking off excess water before you add them to the pan. Cook over high heat until the leaves have wilted, only a minute or so. Add the drained pappardelle and the Gorgonzola and toss everything together, creating a little sauce to coat the pasta. Season with salt and freshly ground black pepper. Divide between plates and garnish with the walnuts.